Click to find out more information about our volunteer program and how to apply. 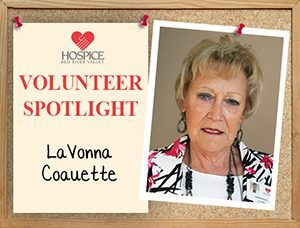 I need something to fill my time, so when I read about Hospice needing volunteers, I decided to give them a call. Knowing what a great service they do and the comfort they give to those in need, I felt it was a good call. I enjoy the friendly staff and helping out with any projects that need to be done. I enjoy reading, playing cards, meeting friends for coffee and visiting.